It is December in Kymlinge and the Hermansson family gather to celebrate a 105th birthday party - dad Karl-Erik is turning 65, his eldest daughter Ebba, 40. But nothing goes according to plan. On the night before the big celebration, Robert, Karl Erik’s son and something of a celebrity after appearing in a successful reality show, decides to take a walk - and is never seen again. The following evening, Ebba’s son Henrik also disappears without a trace. The peculiar case falls to Gunnar Barbarotti, a Detective Inspector of Italian extraction. Could the disappearance of two members of the same family, from the same address, in the space of twenty-four hours really be a coincidence? Is there some sort of plan? Is there a connection? To solve the mysterious chain of events, Barbarotti must uncover the dysfunctional family’s darkest secrets and make the invisible visible - not without finding himself wishing that he had a benevolent higher force to turn to in these most difficult moments. 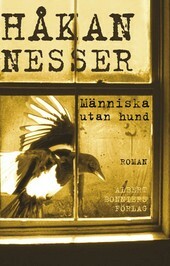 MAN WITHOUT DOG is the first novel in Håkan Nesser’s Barbarotti quintet.